Painting with Light: The Art of Bunch Washington was an exhibition that ran from September 3 – October 31, 2014 at Franklin & Marshall College. The show was presented in partnership with "Rethinking Relationships," a Psychology conference designed to harvest insights gleaned over the last few decades about the nature and causes of healthy relationships. The exhibition was an outgrowth of a course taught by the show’s curators, Elizabeth de Souza, daughter of the artist, and Dr. Michael Penn of F&M's Psychology Department. The course, which ran for three semesters, used Bunch Washington’s life and art as a lens to explore the relationship between art, culture and mental health. It also sought to understand how this relationship has influenced American culture, and its relevance to people of all ethnic and socio-economic backgrounds. 1. Hands-on research: Identifying and obtaining archival documents, interviewing people who knew Washington, collecting information about institutions and environments that influenced him, and researching data relevant to the themes in his life. The F&M contingent visits the home of Les Payne (rear, celebrating) in New York City. 2. Experiential learning: Absorbing a wide variety of material (art, music, text, film, etc.) to stimulate reflection on the ideas and themes of the course. Highlights included a field trip to Philadelphia to visit with archivists at the Barnes Foundation, and a visit to the Harlem-based home of Pulitzer Prize-winning journalist Les Payne, a friend of Washington's and an art collector. Students interviewed Payne about his experiences as an African-American writer of Washington's generation, and also viewed his collection, which includes original works by Romare Bearden, Horace Pippin and Elizabeth Catlett, among others. 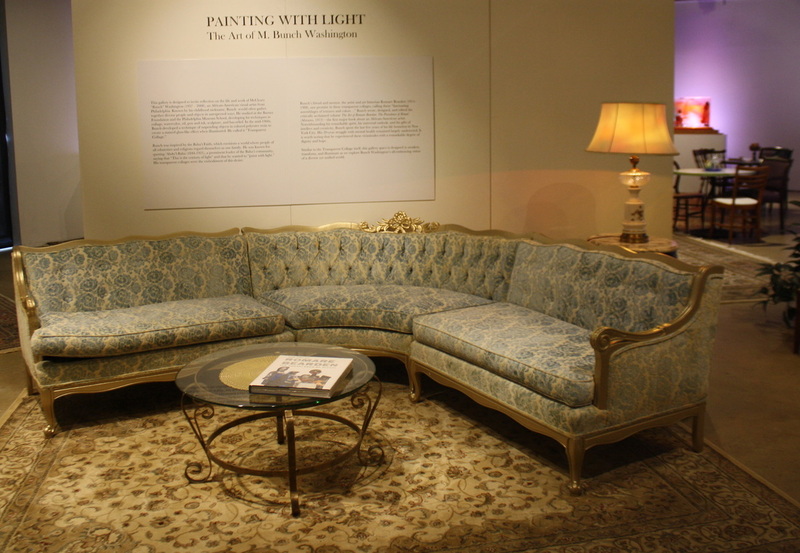 Payne also owns two Washingtons: "Sophisticated Lady," and "Tribute to Les," both of which were exhibited during "Painting with Light". 3. Mounting the show: Bringing to life an exhibition that uses Washington’s signature technique, the Transparent Collage, as a catalyst for reflection about the pressing issues and concerns of our time period. During the show, the students collaborated with a panel of distinguished musicians, artists and writers, including two Pulitzer Prize winners, to create dynamic gallery events that fused the literary, visual and musical arts. Student Dominic Akena's short film about Painting with Light gives the viewer a glimpse into these gallery events and the ideas that inspired them. Inside the Dana Gallery of the Phillips Museum: "Painting with Light: The Art of Bunch Washington"